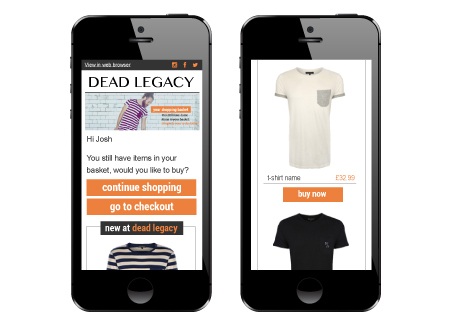 Manchester fashion brand, Dead Legacy was keen to improve customer engagement and generate new leads with the aim of increasing its on-line sales. We suggested a series of campaigns to engage customers and improve communications. Strategic campaigns comprising latest ranges, special offers and abandoned basket campaigns. Campaigns run in a single quarter resulted in transactions by email increasing by 28 per cent for Dead Legacy and customer conversion rates generated from visits to the website via email increasing by 20 per cent with the total revenue generated from emails increasing by 14 per cent overall. Click here to visit Dead Legacy's website. The bottom line. Improved customer retention levels and an increase in revenue. The success of these campaigns proves what a vital tool automated email is within the general marketing mix. Our customers have responded well to these campaigns and are obviously happy with what have been highly relevant and informative communications.